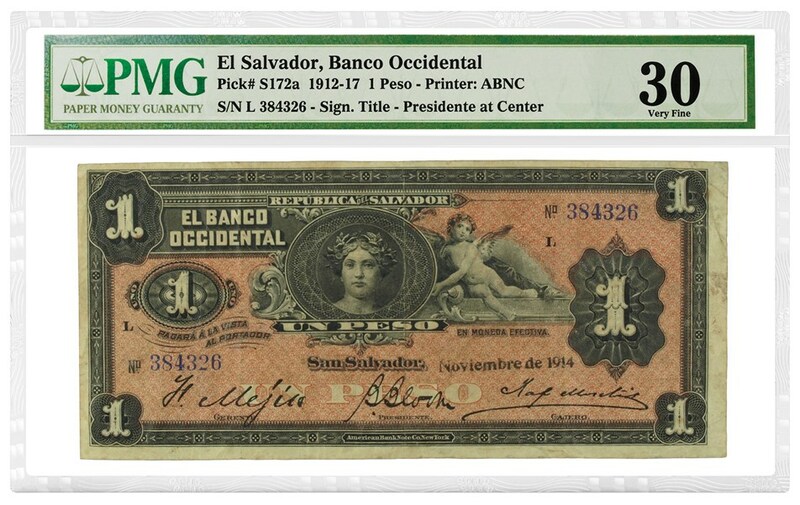 Paper Money Guaranty (PMG) has attributed a new variety of the El Salvador El Banco Occidental 1-Peso note. The first banknotes appeared in El Salvador at the end of the 19th century. Private banks authorized by the government oversaw issuing these notes. Initially, Banco Internacional del Salvador, founded in 1880, had exclusive rights to issue paper money in El Salvador. 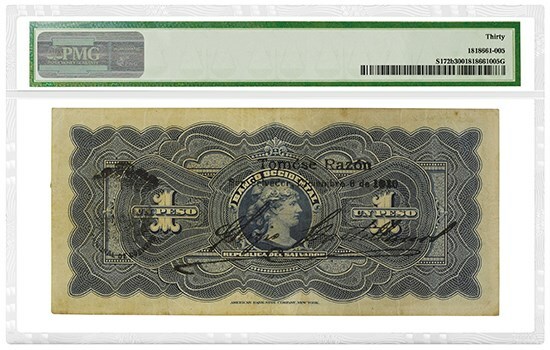 However, by the late 1890s, El Banco Occidental and other private banks such as Banco Salvadoreno and Banco Agricola Comercial were also granted the right to issue bank notes. In 1934, the Central Reserve Bank of El Salvador was created with the sole right to issue banknotes in El Salvador, ending further private banknote issues. Both Standard Catalog of World Paper Money Specialized Issues by Krause Publications (SCWPM) and The Coins and Paper Money of El Salvador by Almanzar and Stickney list an issued 1-Peso note from El Banco Occidental with an engraving of a cherub holding an oval frame with a portrait of a woman at the center and with three signatures at the bottom, the middle signature title being "PRESIDENTE." SCWPM lists El Salvador Pick# S172a as having a red underprint front, a blue back, and a middle signature title of PRESIDENTE. SCWPM further lists a PROOF of this series as S172p having a green-colored back and a middle signature title of "DIRECTOR." Recently, a fully issued Banco Occidental 1-Peso note was submitted to PMG for grading. Unlike S172a with a middle signature title PRESIDENTE, this 1910-dated note has a middle signature title "DIRECTOR" with a similar red underprint front and a blue back. Based on information supplied by PMG, SCWPM has created a new reference number for this variety, Pick# S172b. 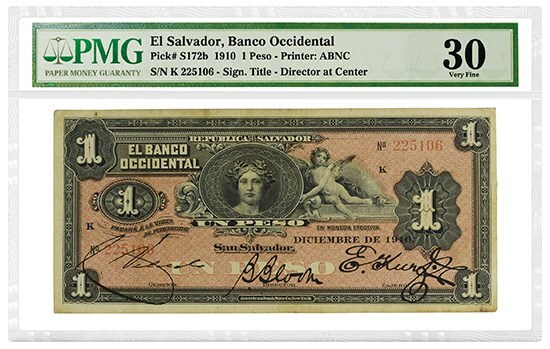 A January 2018 Spink auction in New York was timely in that it allowed for further clarification of the El Salvador S172 series. Offered in the Spink auction was a 1907-dated 1-Peso El Banco Occidental note with green underprint front, a dark green back, and a middle signature title of DIRECTOR. SCWPM has created a new reference number for this variety, Pick# S172c. El Salvador Pick# S172c. Green Underprint. The distinctive “B. Bloom” middle signature is present on all the S172 varieties. This signature is that of Benjamin Bloom, a California-born banker who became a naturalized Salvadoran in 1940. He served as both Director of Banco Occidental after Leon Emmanuel Dreyfus worked to establish the bank in 1889, and later as President when the bank ownership was subsequently transferred to the hands of the Bloom family. The change in the middle signature title of Director on Pick# S172b to President on Pick# S172a marks this ownership change, along with the change in Benjamin Bloom’s increased responsibility at Banco Occidental. After 62 years of existence, El Banco Occidental was liquidated and closed in 1951 upon the death of Benjamin Bloom at the age of 78. Benjamin Bloom is revered in El Salvador for his philanthropic contributions. Upon his death, he donated his entire fortune of approximately $9 million to the government of El Salvador with instructions to establish a children’s hospital. Today, the Bloom Children’s Hospital remains one of the largest and most significant pediatric institutions in El Salvador.